Home is supposed to be comfortable and inviting—to you and to your guests. 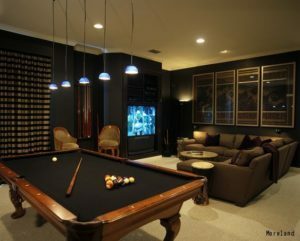 If you’ve been trying to figure out how to create a space that’s uniquely “you” while still getting it ready for company, it might be time to work on creating the perfect man cave. At Windows, Walls & More here in West Bloomfield, we’ll work with you to make the space exactly what you want, from look and feel to function. Speak with one of our representatives today! These days, a “man cave” doesn’t have to be what we always used to picture: a dark and dingy space no one really wanted to spend time in. Instead, it can be anything you want—from a home theater haven with wet bar and wine racks to a chic entertainment billiard room. You can really let your personality show in the decorations. For example, if you enjoying hunting or have a hobby or sport you’re devoted to, display it on the walls. Remember to add accent lighting to give your collection a dramatic look. Your man cave window treatments do matter, and Hunter Douglas has the perfect window treatment to finish the room. If your space is all about movies or the big game, go with a window treatment that will let you control the light, especially one with blackout features, like honeycomb or roller shades. To add a harder edge to your space, go with wood shutters or blinds. A great choice might be Parkland® real wood blinds or, for a more cost-effective solution, look at the faux wood collection called EverWood®. Draperies add another layer of sophistication. Whichever you choose, know that Windows, Walls & More has the right solution that will let you and your friends enjoy your space comfortably.